We are solving series of problems based on the concepts of thermodynamics. 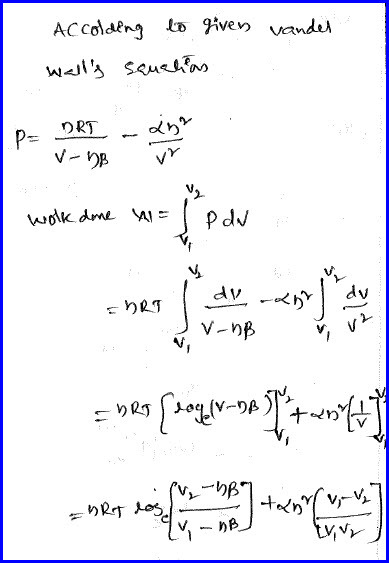 We also deal about calorimetry in this chapter which deals about conversion of heat energy to other forms of energies and its applications further. We do define terms like specific heat and latent heat to explain this properties and they are the basic terms of heat concepts. When there is a change in the temperature, we need to deal with specific heat concept and when there is a change of state, we need to study it in terms of latent heat and during this process, all the supplied heat energy is used to change the state of the system and hence its temperature remains constant. During an adiabatic process,pressure of the gas is proportional to the cube of the temperature and basing on that we need to find the ratio of specific heats of the gas. Problem is as shown in the diagram below. We need to take the relation between pressure and temperature and taking that into consideration with the given data, we can get the relation between pressure and temperature in the adiabatic process and the problem can be solved as shown in the diagram below. 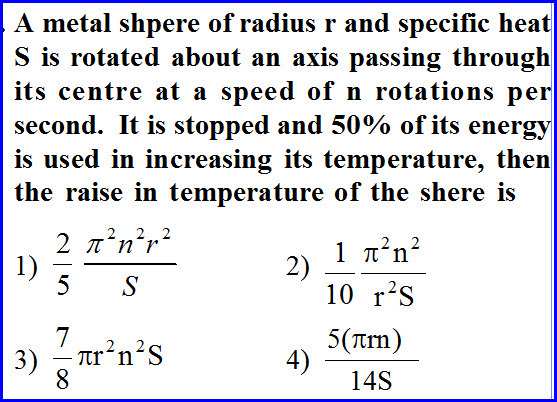 A metal sphere of known radius and specific heat is given to us and it is rotating about its own axis with certain rotations per second. When it is stopped half of its energy is converted into heat and we need to measure the raise in the temperature of the system and the problem is as shown in the diagram below. As the body is rotating it has rotational kinetic energy and half of it is converted into heat energy as per the given problem. Taking law of conservation of the energy, we can solve the problem as shown in the diagram below. The relation between internal energy,pressure and volume is given to us as shown in the diagram below. 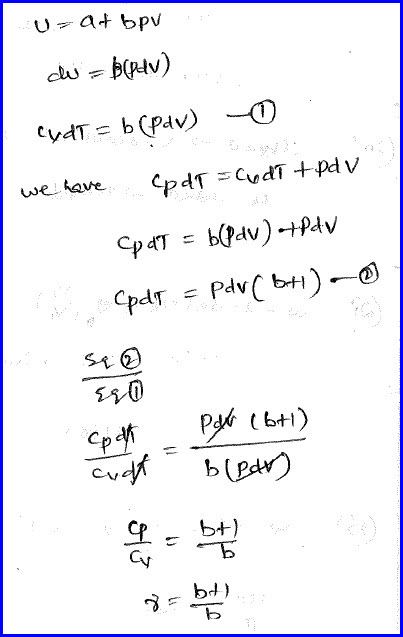 We need to find the ratio of specific heats and some constants are also available in the problem. 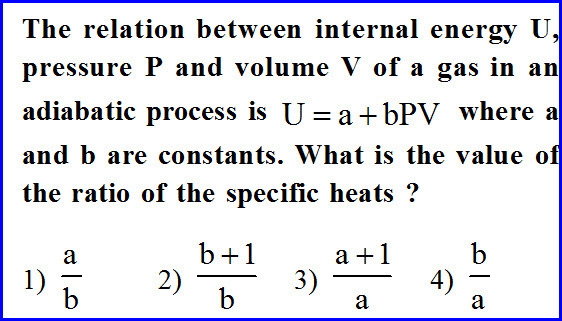 We need to differentiate the given equation to get the change in internal energy and hence it can be expressed in terms of specific heat of the gas at constant volume. Problem can be further solved as shown in the diagram below. 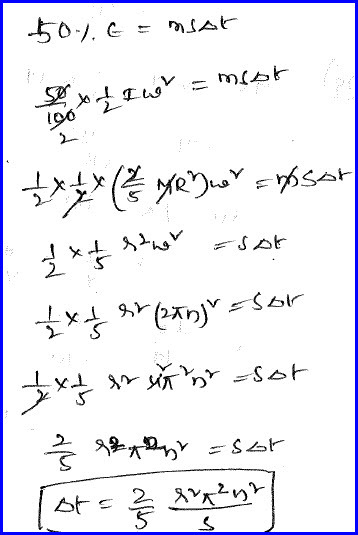 Work done by a system under isothermal conditions has to be determined that change its volume from one to other and satisfy the given equation. Problem is as shown in the diagram below. Relation of pressure with other physical quantities is given to us as shown in the diagram below. We need to measure the work done and the pressure is not constant here. 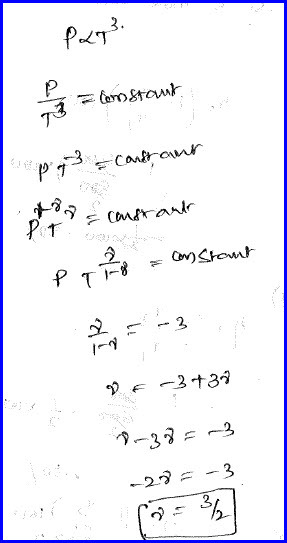 So to get the work done we shall integrate the pressure with the change in the volume as shown in the diagram below. 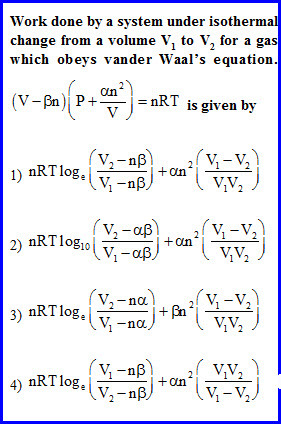 By simplifying the equation further, we can get the solution as shown in the diagram below.